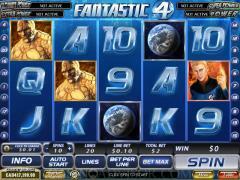 Fantastic Four is the branded slot game released in conjunction with Marvel Movies. It features the super hero team of Mr. Fantastic, Invisible Woman, Human Torch and The Thing. These four super heroes are symbols on the reels. The wild symbol is the Fantastic Four Logo and the scatter symbol is the Earth, which the super heroes are responsible for protecting. High value cards from Ace to Nine also appear as symbols. These have a steely appearance in keeping with the strength of the super heroes. 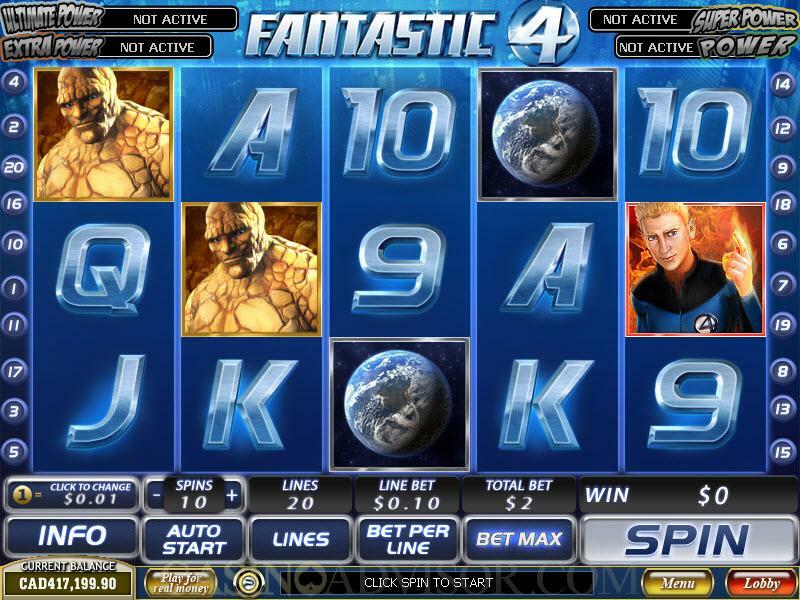 In Fantastic Four players can adjust all betting parameters. The coin size can be varied from 0.01 to 5.00 in 8 stops. Players can activate up to 20 paylines and wager up to 10 coins per payline. When three or more Earth symbols appear scattered on the reels the Free Games feature is triggered. This feature awards 12 free spins in which any of the Fantastic Four can appear stacked on Reel 3. Depending on which super hero appears stacked on Reel 3, the corresponding special feature is triggered. In Mr. Fantastic special feature four extra spins are awarded in which the Mr. Fantastic symbol becomes an expanding wild and substitutes for all other symbols except the wild and the scatter. In Invisible Woman special feature one total bet is awarded along with four extra spins. During these spins whenever Invisible Woman appears at least once the multiplier increases by 1. In Human Torch special feature four extra spins are awarded in which Reel 1 is covered by the expanded Human Torch symbol and held. In The Thing special feature three extra spins are awarded. In these spins when The Thing symbol appears it becomes wild and freezes. The Free Games feature cannot be retriggered. Fantastic Four has a progressive jackpot that is networked to the Marvel Mystery Jackpot. This is a four level jackpot with the levels in increasing order being Power, Extra Power, Super Power and Ultimate Power. The Jackpot Game is randomly triggered and can appear after any spin. But the higher the wager, the greater are the chances of it being triggered. Once the Jackpot Game is triggered the player will win at least one of the progressive jackpots. The game has a 4 x 5 grid of 20 squares that hide the symbols for the various jackpot levels. The players click on the squares to reveal the symbols. The first three identical symbols revealed results in that jackpot level being won.